Some innovative ideas for your bathroom remodel. I’m happy to present this guest article by Handy Man, author of Handymanfixhomerepair.com. In most houses, the smallest room is usually the bathroom and it can be pretty frustrating to find ways to make it look new. Your space is so limited that the newer tubs may not fit and it’s very hard to get inspired when you’re dealing with what amounts to a small closet with a toilet. However, there are a few tricks that will make your whole bathroom look like new, and increase the amount of overall space. 1. Install a pedestal sink. Our cabinets take up way too much space and usually end up a cluttered mess. You can dramatically open up the bathroom by ripping out those cabinets and installing a pedestal sink. They are quite economical and today’s pedestals come in a wide variety of designs and colors. You’ll be saving feet of space and your bathroom won’t feel so cramped. To address the issue of the lost storage space, you can install shelving and use baskets, or work with a linen closet to find new ways to store your stuff. Chances are, you don’t use half the stuff that was stowed away in your cabinets, so this is a great way to break through the clutter. 2. Put in a light colored floor. If you’ve got carpet in your bathroom, it’s something you’ll need to change out (for good reason! ), but even if you’re dealing with a tile or linoleum floor, it’s time to get an update. There are many new flooring materials out there that can really make your bathroom feel much more luxurious. If you’re short on skills and budget, go for peel and stick tile in a light color. This will really open up the space and make it feel much larger. 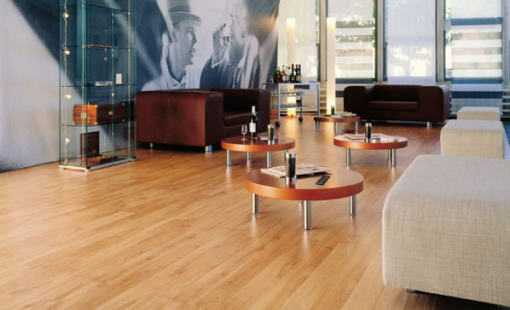 If you’re going for a zen feel, look for laminate flooring in a maple or light finish. This is also very easy to install and will wear pretty well in the bathroom. Just remember to make use of floor rugs to avoid slipping while coming out of the shower or tub. 3. Look for a corner tub. Most of us would love to have a garden tub, but when you’re dealing with a limited amount of space, your options are also pretty limited. However, there are some new models that are designed to fit into the corner of your bathroom, and even small bathrooms can usually accommodate this type of model. Instead of using up a lot of lateral space, you’ll be taking up a corner which isn’t used much anyway. The main drawback of these tubs is that they are usually deeper than longer, but they are a nice switch from the standard tub of yesterday. If this isn’t an option, rip out that old standard tub and replace it with a clawfoot. Again, they’ll be a bit deeper than they are long, but they do take up less space. 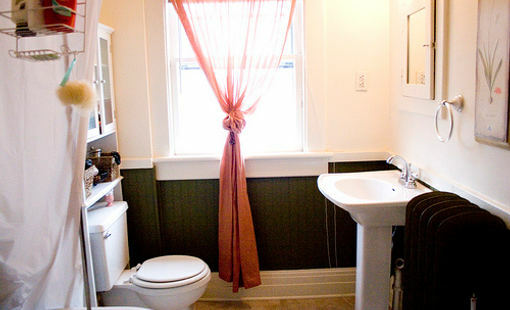 Whenever you’re redoing your bathroom, remember that even though the space is small, there is a lot you can do with it. Focus on light colors, adding light and working within the space to make it seem a lot bigger and more inviting. What’s also great about reworking your bathroom is that by giving it a modern or new feel, you’ll likely get a pretty good return on your investment, since a bathroom remodel is considered one of the top ways to increase the value of your home. @TDL Readers… Please comment as I love to get feedback… Feel free to stop by my place anytime.. I can’t stand pedestal sinks. That stuff you have to store is the stuff you have to store. I’d rather hide it in a cabinet that leave as an eye-sore on shelving or in baskets. At best, you are just moving the issue. I also prefer sinks with storage cabinets underneath, but I can vouch for the spacious effect that pedestals give. My relatives remodeled their smallest bathrooms and the pedestal sinks they chose were a good fit for the very small rooms they had. I think that small bathrooms can benefit from these types of sinks, certainly. For larger bathrooms, I’d opt for built in cabinetry of course. But many people do like the pedestals for the cosmetic appearance and will place them in any bathroom, regardless of size. Nice ideas. I am thinking to change the floor color. The current color is dark brown. I choosed it to avoid the floor look dirty when I absence to clean up. Peel and stick is very good idea. I agree with Lazy Man, pedestal sinks are OK for a hallway powder room or half-bath, but they don’t make much sense for a full bath where you need to store stuff like TP, cleaning products, trash cans, etc. I do like the idea of light floors though. We redid our bathroom a couple years ago and used a light beige ceramic tile that turned out great. It’s just dark enough to hide wear but not too dark to make the room seem smaller. I’m a firm believer in tiling bathroom floors. It is easy and inexpensive and it looks great! Moreover, if you have the skill, tiling the inside of your shower/bathtub looks a lot better than those injection molded tub/shower units. My wife and I also added baseboard in our bathroom. I know there are concerns about it absorbing H2O, but it looks good and I’m not that worried. Of course, repainting is always a good one too. I know a few people who are just modernizing their sinks. Funky glass and interesting designs are all available at good consumer prices now and they look amazing in a bathroom! I agree with so many folks here. I don’t like pedestals, but they can look good. Storage for all the toiletries is always an issue. Not to mention the inconvenience when you are shaving, brushing, preening, etc. Just not enough space. Great idea on the corner tub. I like them a lot. With the windows you get good natural light and still have privacy. Great ideas. These don’t have to be expensive options. We have clients that are using Ikea Hacks to get some inexpensive remodeling items that look very expensive. How about resurfacing your current tub? I always thing that new taps (bought separately) look better than a lot of the ones which come with a 3 piece bathroom suite. Nice tips my friend! 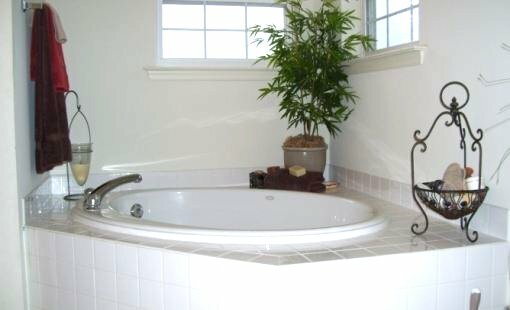 Must say, I do agree with you about corner tubs, they are very nice and also convenient if you have limited room. Can’t beat a wet room, however, if you’re feeling really plush! Pedestal sink install… not that difficult. But for any novice (or barely novice) you can always paint. For me it’s the easiest way to freshen up any home interior. The corner tub is a great idea for some bathrooms. Sometimes corner tubs open up a world of possibilities for tight spaces! I really like the way you suggest a corner tub, however it may also a good idea to put small cabinet as alternative if a corner tub is not an option for the bathroom remodeling. This is a nice article. For flooring I advocate something like floor tiles over laminate, since laminate floors sometimes get buckled and uneven when subjected to moisture. Your explanation is very interesting and gives me inspiration about bathroom remodeling. If I may add, you can add lighting in the room that can be set in such a way. When you want the room lighter or darker, you only need a button. Anyway thanks for posting your tips. I would not recommend dark flooring for bathroom remodeling because it gives off a dirty look. I currently have that and regret the decision. That looks good. How about installing a new sun roof… It might be cheaper and more environment friendly to do so. Very interesting ideas. One of the first things you’ll consider when thinking about a bathroom remodel is what to do with the tub or shower, and your choice will make a huge impact on the overall success of your project. Even installing a glass or copper vessel sink really makes the bathroom look posh and upscale for a relatively low cost! spectacular ideas..I find that most people love to have there space in the bathroom, my self included. I like the idea about you saying “go for peel and stick tile in a light color”. I will have to take you up on that. Carpet in a bathroom? Yuck. Carpet anywhere for that matter is icky, I much prefer basically anything other than it, including (gasp) linoleum. Can’t beat light colors/tile IMO, great way to brighten up a room and make it seem more spacious. Also, overhead storage is good too, especially if you go with the pedestal sink. Love the corner tub idea! You could make a bathroom seem much more spacious with this idea!